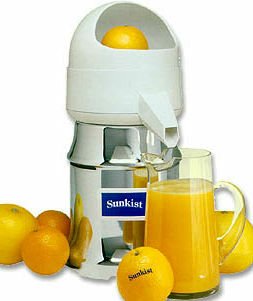 The Sunkist Commercial Juicer for fresh-squeezed citrus juice the consumers prefer. This machine can juice all day. Produces 10+ gallons of juice per hour. See operating instructions below. This model (J-1) is Certfied For Commercial or Residential Use in USA or Canada. 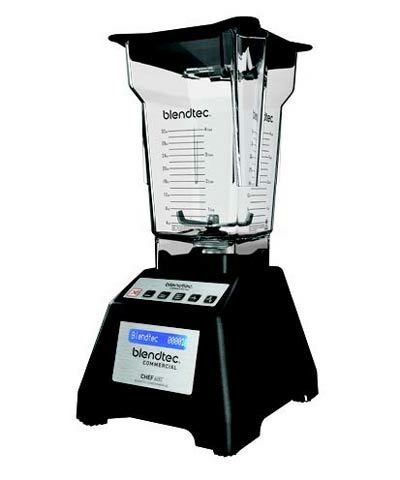 Shipping weight 37 lbs, carton size 9.5" x 9.5" x 23"
A commercial juicer that endures extended daily usage, and features a metal oscillating strainer for better separation of the juice from the pulp. By using pre-cut citrus, this juicer can easily extract between 10-12 gallons of juice per hour. It comes with three extracting bulbs,one each for lemon/lime, one for orange and one for grapefruit, each with metal inserts. It has a quiet, heavy-duty motor and is housed in gleaming, chrome-plated steel. 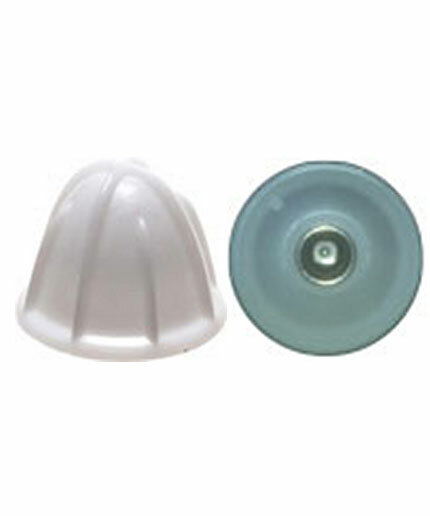 Dome, spout and bowl support is made from corrosion-proof white plastic. All removable parts are dishwasher safe. It's extremely safe to use, and comes with a 2 year warranty. It listed by Underwriters Laboratories, NSF International, CSA International, and VDE (Germany); and is also approved for use in Europe. Only operate on the electric current indicated. Make sure the strainer and extracting bulb is properly in place before switching the juicer on. All citrus' need to be halved, and their stems trimmed, before they can be juiced. Turn on the juicer and leave running until the juice has been extracted from all citrus halves. Grasp the citrus half about 3/4 of the way down from the top of the fruit. Hold firmly on rotating extracting bulb, until all juice is extracted. Remove fruit peel and repeat. Always empty strainer when it is 3/4 full or less, and clean the bowl support. It only takes a few seconds to get all the juice from the citrus half. Don't over extract or the bitter tasting albedo will be in your product. Should your juicer overheat and stop operating, let it cool to room temperature and then press the reset button on the bottom of the machine. To extend the life of your juicer, it is extremely important that liquid does not enter between the bowl support and the motor housing. Do not pick up the juicer by the bowl support, it can cause cracks where liquid can seep into the motor. Do not put juice in galvanized, wood, brass or bronze containers. Motor never needs oiling; bearings are grease sealed. To remove the strainer, slide strainer puller completely under edge of square strainer hub. Turn knob on top of strainer puller clockwise until strainer loosens. Remove strainer puller; lift off strainer and empty contents. NOTE: Failure to comply with any of the preceding instructions may result in cancellation of the warranty. Power cord or motor should not come in direct contact with water. After each use, unplug the juicer, remove and thoroughly wash and dry the spout, dome, strainer and extracting bulb. Wipe away any juice that may have accumulated in the bowl support with a damp sponge.